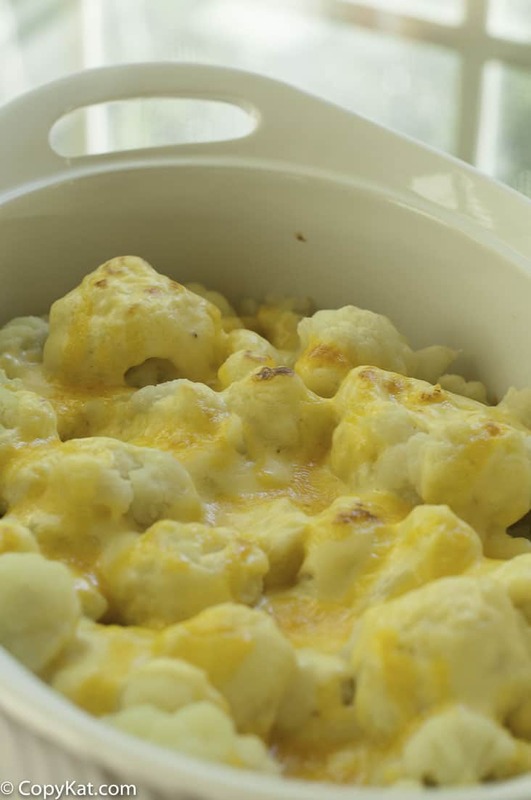 Cheddar Cheese Cauliflower Bake is a flavorful side dish for those who love cauliflower. Baked cauliflower is a side dish you can put together and bake when you are ready to serve. I don’t know what is it about cauliflower. Even if you live with a household of people that are not in love with vegetables this one that can turn those who don’t love vegetables into people who are asking for seconds. You can buy cauliflower whole from the grocery store, or you can purchase bags of cauliflower that has already been cut up, you choose. Cheedar cheese cauliflower bake is a great side dish to make anytime. You can make this side dish ahead of time, and serve it whenever you like. Not all side dishes reheat as well as this one does. To make this dish, you are going to cook the cauliflower in boiling salted water, then pour a cheese sauce over the top. What makes this dish special? A touch of dry mustard powder adds just the right amount of zip and zing to this classic side dish. Cheddar cheese sauce needs a touch of heat to make the sauce just right. I know you are going to love this way to prepare cauliflower. Here are a few other great ways to prepare cauliflower. 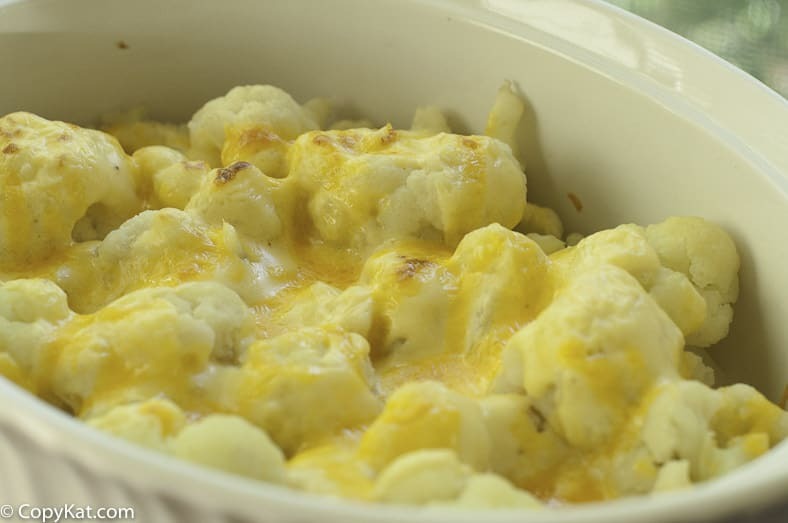 Cheddar Cheese cauliflower bake makes a great side dish that reheats well. Preheat oven to 350 degrees. Cook cauliflower in a large pot of salted water. The cauliflower should be tender, but firm. The cooking time should be 5 to 6 minutes. While the cauliflower is cooking, start the cheese sauce. Melt two tablespoons of butter in a small saucepan. When the butter has melted completely add the flour. Cook flour for 1 to 2 minutes. Slowly begin to add milk, which each addition of milk the sauce should thicken. Add in the dry yellow mustard and stir in to combine. When all of the milk is added add 4 ounces of cheese. Stir in the cheese until it melts completely. Place cooked cauliflower into a large casserole dish. Pour cheese sauce over the cauliflower. Sprinkle remaining 4 ounces of cheese over the cauliflower. Place the cauliflower into the oven and bake for another 15 minutes. When the cheese should begin to brown slightly the gratin is done. This looks great! Could I use frozen cauliflower in this recipe? Would I change anything if I used frozen? Delicious recipe Stephanie!We do the same with graviera cheese and kefalotyri on top(for the gratin), and it’s delicious!Haven’t tried the mustard though, it sounds fantastic!Thank you for the yummy idea! My mom makes a similar baked veggies dish and it is one of our favorite holiday sides. Yummmmm! Sounds like a nice healthy low carb dish. I bet it tastes great especially since there is cheese! I love cauliflower and cheese! This looks delicious, I’m going to have to pin this for later! I have never tried a dish like this but I know I would love it! Cauliflower really is a crowd pleaser veggie, isn’t it? 🙂 Yum! Pinning for later! This looks great! It’s like mac and cheese in a healthy way! My kids would love this too. I love cauliflower and with cheese, my kids will too ! Thanks ! I hope your kids enjoy the recipe. Cauliflower is such a fabulous vegetable! We add dry mustard to most of our cheesy dishes, but I’ve never made this. Our weekly menu has mac and cheese slated for Tuesday, but I think I can swap out the noodles for cauliflower and top with some crumbled bacon. YUM! I love your addition of crumbed bacon! OMG I am in love with this. I do love my cheese adn anything cheese can go on. I am so making this tonight. What a terrific and healthier alternative to other potato side-dishes (such as Potatoes Au Gratin, or Scalloped Potatoes). This sounds SO delicious, and I definitely serve this as one of my sides- the next time I make a baked ham dinner. Thanks for your lovely recipes, Stephanie. I really enjoy your site and can’t wait to try all the delicious sounding recipes. Great job you do! !